Country Engagement approaches will differ from country to country, as each country will adapt and fit its engagement with the Partnership to their unique context. Flexibility in responding to government priorities by the Partnership is key to making the Country Engagement process effective. Read the country case studies below to see some examples. 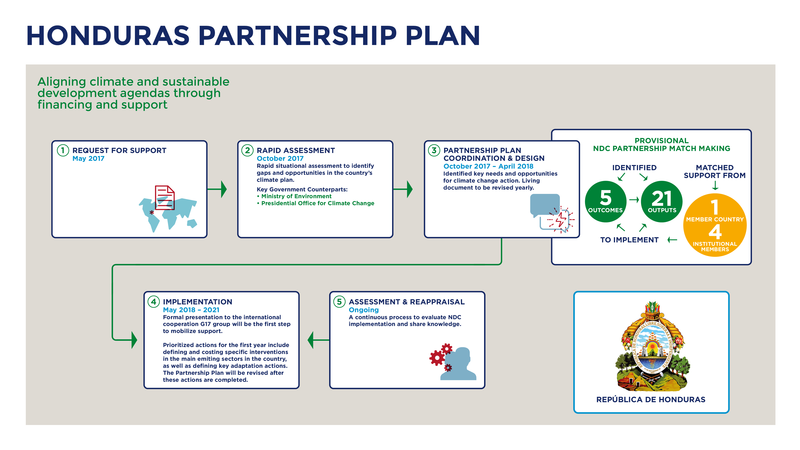 The Presidential Office for Climate Change, the Secretariat of Natural Resources, and the Environment of the Republic of Honduras approved the country’s Partnership Plan in May 2018. 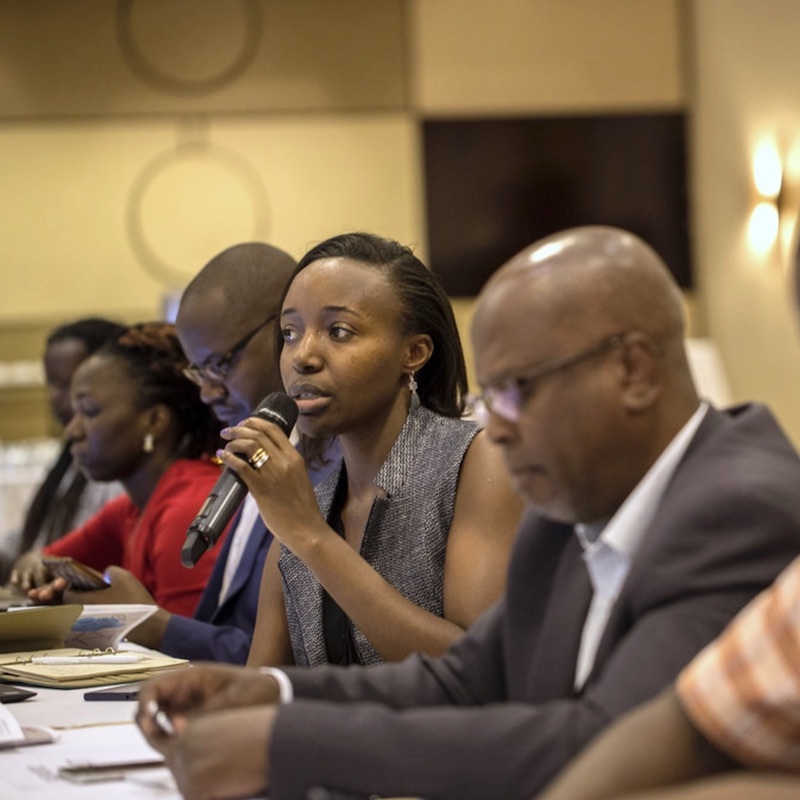 Strengthening inter-institutional coordination for climate action. To deliver on these priorities, the plan identifies 21 activities to be carried out over the next three years. In Honduras, more detailed and elaborated studies and improved data, provided through support from GIZ, UNDP and UN Environment, are enabling the country to revisit and revise its NDC in 2018 as opposed to 2020. With better baseline emission data and 2030 business-as-usual projections, Honduras will be able to submit a more precise and more ambitious NDC at COP 25. 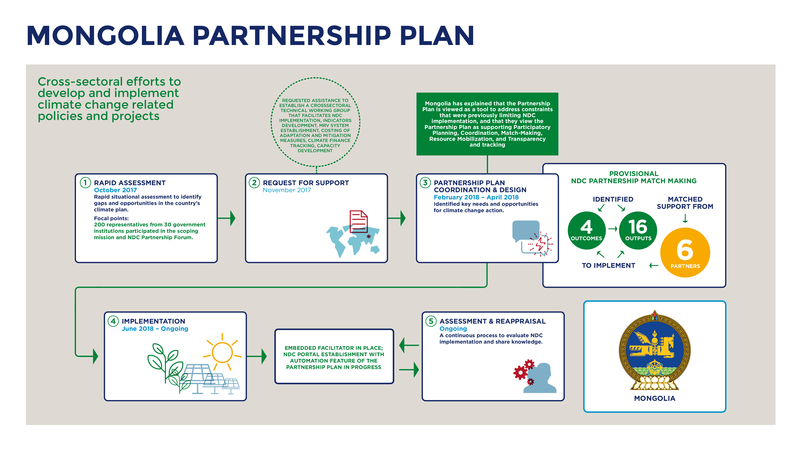 Mongolia is the first country in the region to launch a Partnership Plan, and is setting a positive example on how to involve all relevant government bodies, Implementing Partners, and donors in its implementation. In support of Mongolia, the NDC Partnership organized the first ever NDC dialogue that helped raise awareness of what NDCs are and how sectors are expected to contribute. Mongolia’s Plan puts in place mechanisms to ensure its successful implementation, which in turn will ensure Mongolia meets its commitment to achieve a 14 percent reduction in greenhouse gas emissions by 2030, compared to a business-as-usual scenario. Strengthening capacity of government, non-government and private sector officials to effectively implement the country’s NDC and link it to relevant development plans and strategies. The NDC Partnership, at the request of the Ministry of Environment and Tourism is building an online platform to facilitate cooperation on the implementation of Mongolia’s NDC. The platform will enable government and Implementing Partners to quickly and easily exchange information and improve collaboration on NDC implementation activities, share and access relevant information and documents, and clearly identify how individual actions and projects play an essential role in reaching common climate goals. The government will establish a national Steering Committee and a Technical Committee to coordinate NDC implementation. 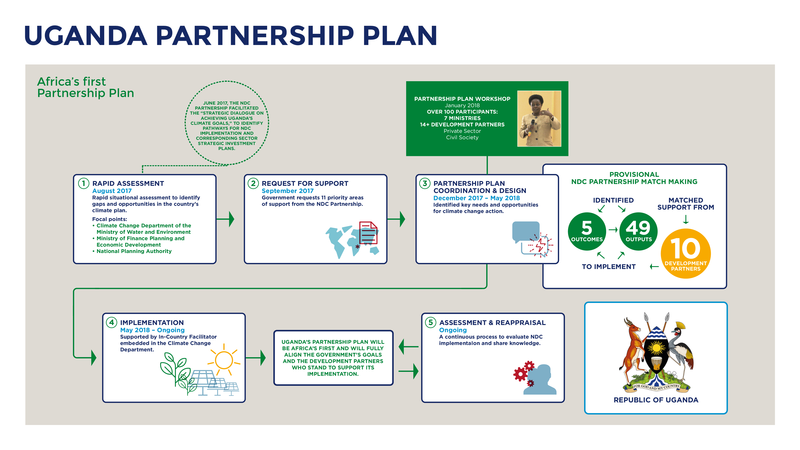 As Africa’s first Partnership Plan, the Uganda Partnership Plan represents a true partnership between the Climate Change Department of the Ministry of Water and Environment, the Ministry of Finance Planning and Economic Development, and the National Planning Authority. 16 members and non-members signed off on the Partnership Plan in June 2018 and now 21 Partners are actively contributing to it. The development of Agricultural Insurance Schemes. An In-Country Facilitator funded through the Dutch government is now coordinating the implementation of the Partnership Plan. You have completed this Section. Return to home page.